It begins with his being awakened by a phone call from his barely coherent son, a Marine Corps platoon commander in Iraq. Brent Jr. had been seriously wounded, but the battlefield nurse allowed him to get on the phone briefly after surgery. The football experiences the author then reflects on took place eight years earlier. 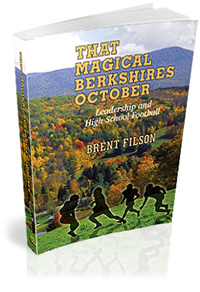 That Magical Berkshires October examines the relationship between father and son and how their defining football experiences, separated by decades, came together in time of war to shape a transcendent vision of leadership. This inspirational book will be available for shipping in September 2008.